I am getting along very well with my cycling partner John, but before I seemed to be jinxed. 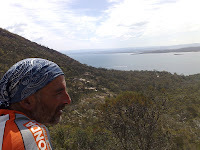 My first attempt to find a hiking partner here in Australia led me to a German guy called Reiner. 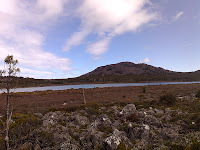 I found him through another hiker and we emailed back and forth for a while until we finally met on the Bibbulmun Track. 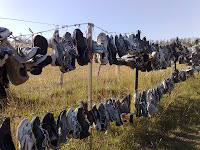 I know that hiking is no beauty contest but meeting Reiner was some sort of a shock. Reiner is about 1,65 m (I am 1,84m) and has hair growing out of every face orifice. I am used to hikers having a beard, but not to dreadlocks growing out of ears. On top of all that Reiner was the most negative person I have ever met on a hike. He has been to Australia 6 times and hiked the Bibbulmun Track about 4 times, but in a 2 hour conversation he did not say a single good word about either one of them. It was very clear to me after 5 minutes that there was no way I would hike with this guy - compatriot or not! My next attempt was an add on the crazyguyonabike website. 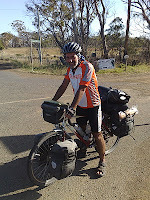 I was looking for a travel partner for Japan and ended up with Mark cycling around Tasmania. I have already posted that Mark left me on day 2, but I have not written yet about his peculiarities. Mark was riding a folding bike. There is nothing wrong with that. The folding bike was transported in a suitcase that converted into a trailer. I am not kidding you now, but I was following a guy on a folding bike with a red Samsonite suitcase trailer. On top of all that Mark had some sort of a unfortunate figure. He was not bad looking, but he was sort of 7 months pregnant. That is nothing a nice shirt could not tactfully hide, but Mark decided to wear bike shorts that had fit him 5 years ago and a bike shirt he had traded with a Japanese cyclist (who was probably half a meter shorter than Mark). It was very difficult to keep looking into his face and not onto his exposed belly buttom... 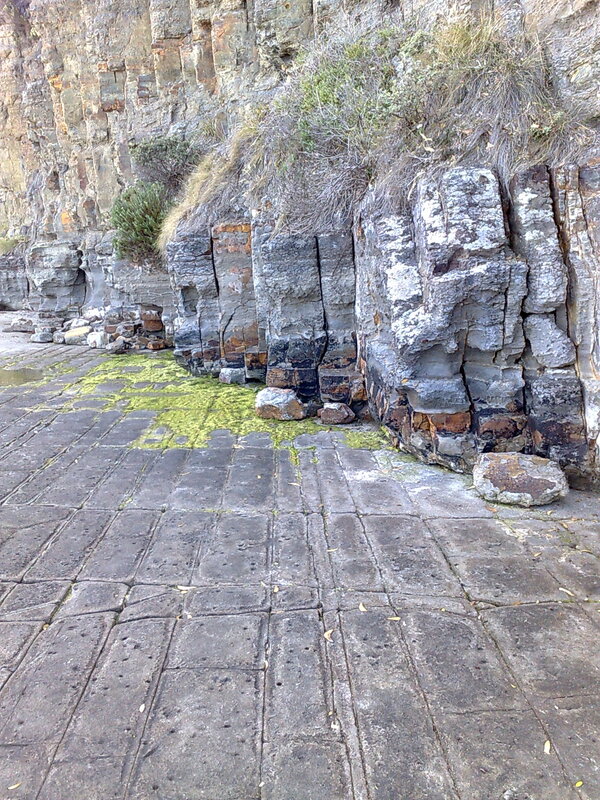 I still do hope he was having a good time in Tasmania without me. As bad as my trip to Tasmania started - it ended very nicely. Cycling with John for a week was so much fun: We barbecued sausages on his petrol stove and had a bottle of wine for dinner. John is definitely not an ultralighter: He is carrying a teddy bear (only 5 cm big) and a kitchen sink (collapsible, it is more like a water carrier - but still!). But he also carries a very useful picnic blanket for our gourmet dinners and a real Swiss army knife. It also takes him half an hour longer every morning to pack up all his crap... When cycling together we averaged about 70 - 80 km every day. 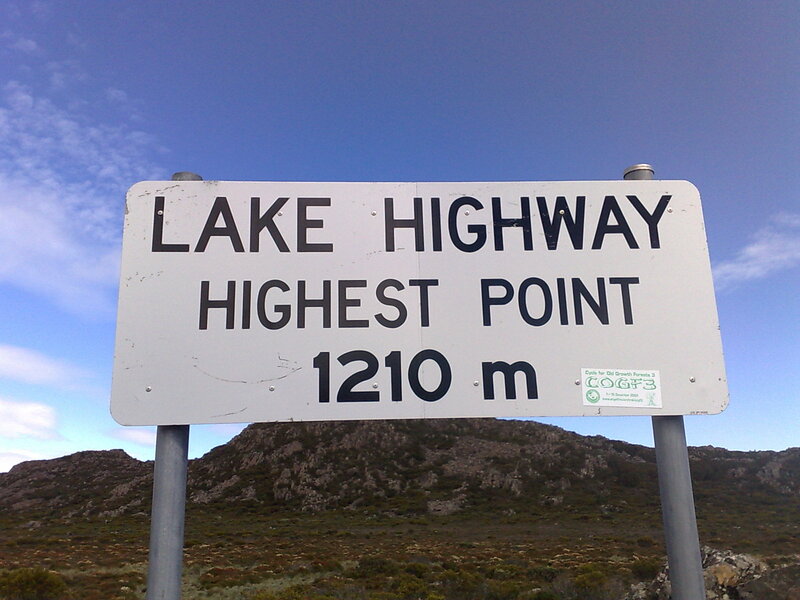 That is not much, but still ok considering that Tasmania is very, very hilly (according to his bike computer we had an average elevation gain per day around 1.000 m) and we ended up in all sorts of interesting discussions every day. We got along so nicely that I decided to continue cycling with him. 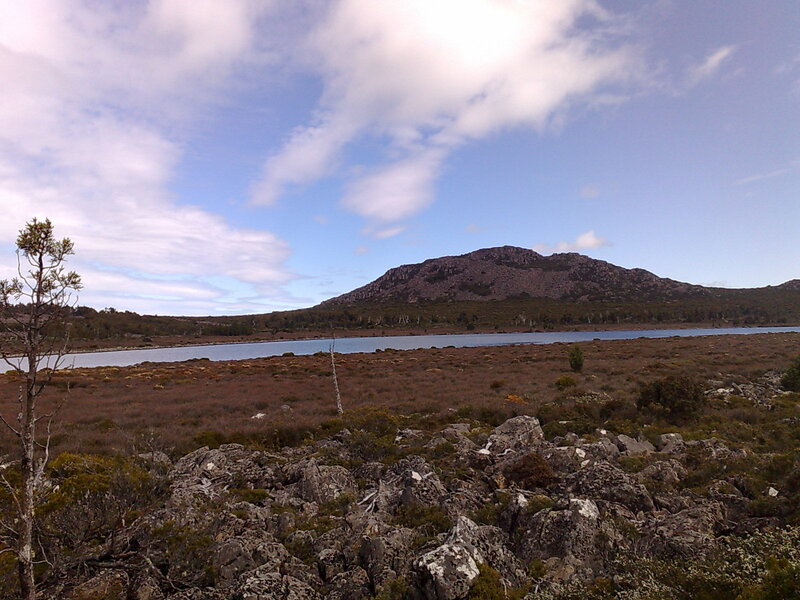 John went back to Melbourne and I did a shortcut across the Tasmanian Highlands to go back to Hobart and fly out to Melbourne as well. This shortcut involved only one minor problem: I had to get up to the central plateau - and that is an elevation gain of 1.000 m in one go. And after that 30 km on my beloved dirt roads through the middle of nowhere. I was not very happy. To my big surprise everything went extremely well. I climbed up 1.000 m in 2 hours and was not even very exhausted (you have to keep in mind that 1.000 m is not much for hikers, but demanding on a bike). The dirt roads turned out to be not too bad and the weather cooperated. Add some really spectacular scenery and I had one of my best days on a bike! With 3 days I was much faster than I expected and made it back to Hobart earlier than planned: Time to visit the Cadbury chocolate factory there. In their factory outlet they sell 5 kg of chocolate for 40 AUS$ - I was very tempted, but no, I already had a baggage weight problem. Today I flew back to Melbourne and I can proudly say that I am an expert now in disassembling and assembling my bike for transport in a bike box! What happens next depends a lot on the forest fires. The situation is still very unpredictable. I thought it might be wiser to go cycling than hiking in that situation. John and me will cycle along the Great Ocean Road together and probably even all the way to Adelaide. That will probably take 2 weeks. After that John flies on to the US and I will do some more hiking in Australia - all depending on the fire situation. Cross your fingers for me! 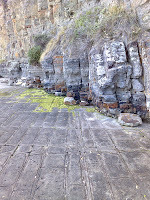 After Mark left me I went back to the youth hostel in Hobart to recover from the shock and make new plans. 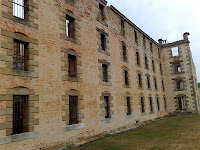 After I had treated myself to wonderful food in a great Indian Restaurant and having had a good night's sleep I decided to start my tour around Tasmania by cycling to Port Arthur to learn about Australian convict history. I really liked historic Port Arthur, but was still not too enthusiastic about cycling. 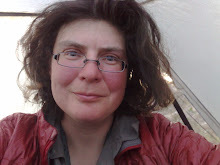 Everything seemed to be so difficult: Getting water, finding campsites, dealing with the weather - I did not feel in my element. On my way back I ran into another cyclist going the opposite direction. There are not many cyclists around, so we both stopped to talk. We talked quite a while and even longer and then decided to camp together. We got along so well that John gave up on his plan to go to Port Arther and decided to cycle with me in Tasmania. 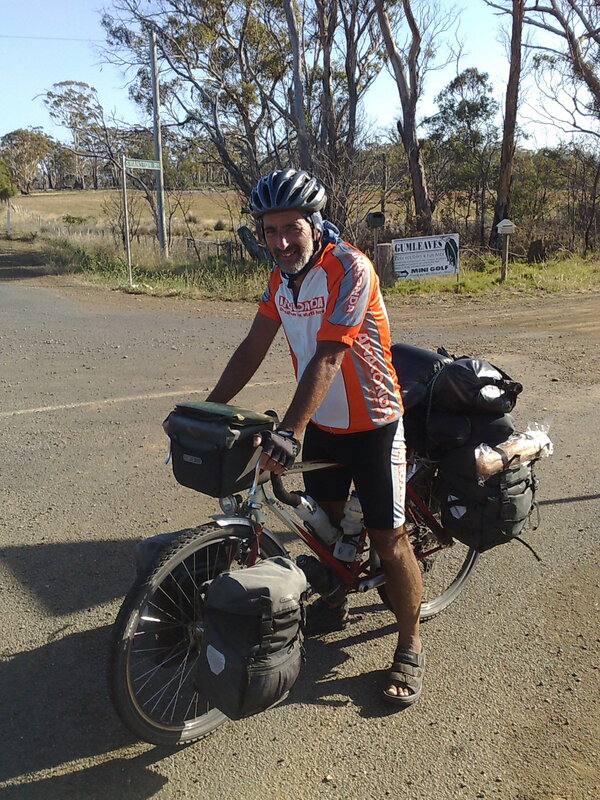 John is cycling around the world and has been on tour now for 22 months. So we have many stories to tell each other. He loves stealth camping like me so we are in for an adventure every night. Actually we are having so much fun that I will follow him back to Melbourne from where we will cycle to Adelaide together. There are so many forest fires in the bush now that hiking does not make much sense. Our first day of cycling brought us to Wielangta Forest Drive, a dirt road through thick forest with even some primeval forest left. Although very interesting cycling on rutted dirt roads was too much for me. John had to wait for me a lot. 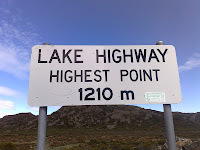 We cycled to Freycenit National Park to see the famous Wine Glass Bay and in order get there you can either take a long detour on roads or take a pedestrian and cyclist only ferry. We opted for the ferry which turned out to be a one man operation with a sports boat - but it worked. We even did a cheesy touristy thing and visited a zoo where you could feed kangaroos. It was expensive and tacky, but so much fun! I really start to enjoy cycling now and thanks to the adjustments Alan made on my bike and have not had any hand problems any more. I even start looking forward to cycle in Japan! Life is good again.